When something inspires and motivates you, when it makes what you already love seem even more fun and worthwhile and connects you with lots of others who feel the same way, you want to be part of it. And last weekend I got to be part of the York Festival of Writing 2017 in a different capacity to my two previous visits back in 2012 and 2013, because this year I was teaching a workshop and working as a book doctor holding one-to-one sessions with writers. I won’t revisit the game-changing impact of the Festival on the earliest stages of my writing career (you can read about it here, in my blog post for Writers’ Workshop); I will say that I missed it a lot these last three years and (however uncool this sounds), that it became a personal ambition to make it onto the invariably brilliant programme. 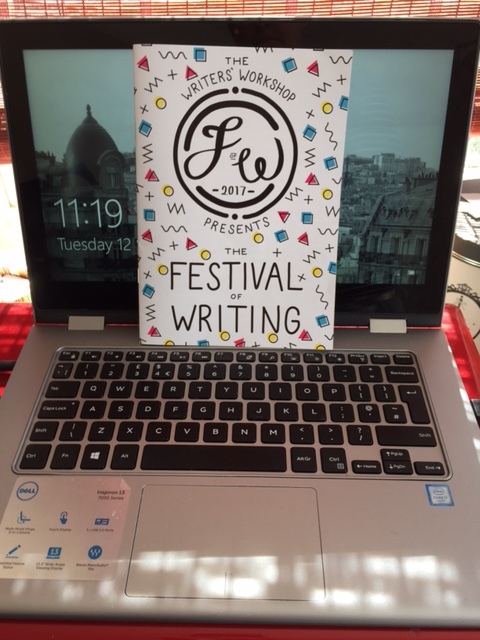 Over the past year, I’ve loved developing the Resilient Thinking: Perseverance and Motivation for Writers workshop which my co-presenter, author and psychologist Voula Grand, and I delivered as a Friday mini-course at the Festival. The idea emerged from the huge response to me sharing my (extensive) experience of dealing with rejection here on the Literary Sofa and the conversation it started back then. Voula and I feel strongly that the psychological challenges of writing merit more attention (or indeed, any) and we were delighted to make it onto the York programme – along with Debi Alper’s new Facing the Fear workshop. The Resilient Thinking skills we teach are based on the principles of cognitive behavioural therapy and can help us challenge negative beliefs (like ‘my book is terrible’) and recover more quickly from the inevitable setbacks writers face throughout our careers, not just at the beginning. All of this is just as applicable to life in general: the workplace, parenting, relationships… It’s no exaggeration to say these skills have transformed my entire way of thinking. In June, we did a full length test workshop with a roomful of MA Crime Writing students at City Uni which went really well. On Friday at York, it was no less rewarding with just a handful of participants – this kind of session also works on a more intimate scale. We had wonderful, emotionally intelligent people who really engaged with the ideas and the techniques; there were some great discussions and Voula and I were so pleased they felt it was a good use of their afternoon. Our only frustration was not having been able to share it with the many who expressed an interest over the weekend, but it’s early days and we plan to do lots more of it. We’d like to think that what we do reflects the general ethos of the Festival of Writing in being constructive, realistic and encouraging a love of writing rather than focusing solely on publication. One of the things which makes this weekend so special is being surrounded by hundreds of people who love what they do and are willing to learn and work hard to get better at it. I enjoyed my stint as a Book Doctor and was impressed by writers’ openness to receiving professional feedback, which is a skill in itself. Every manuscript raised points leading to great consultations with the authors – it’s so exciting to see work in progress and imagine where it might lead one day. And York does famously lead places. I think it gets the balance of dreams and reality just right. There’s no fighting shy of deeply unpalatable statistics like one in a thousand manuscripts attracting the agent representation usually required to access the traditional publishing industry. But success comes in many forms (the least likely being massive deals and megabucks, obviously); it means different things to each of us and there are more opportunities to connect with readers than ever before: self-publishing has a strong presence on the programme now, and one of the keynote speeches was by Mark Edwards and Rachel Abbott who’ve achieved incredible results that way. For some writers, York is a direct route to big success and the buzz around its renowned competitions is very much part of the weekend’s excitement. The standard of writing and performance at the Friday Night Live competition was… I was going to say ‘outstanding’ but the whole point is that the pieces were all brilliant, in very different ways. The winner was Sophie Snell with her excerpt from The Pear Drum which won The Bath Novel Award this year. I particularly enjoyed the gripping and entertaining Open the Doors by Loretta Milan, whom I have known online for some time but never met before. (Do check out her excellent Literary Lightbox blog – you can read our interview on Being Bold with Fiction.) I spent the whole weekend meeting up with old friends and making new ones – that’s how this thing works. And on Saturday night, a lot of us were very happy to see talented friend Ruby Speechley win the Best Opening Chapter Award and get runner-up in the Pitch Perfect prize, both of which sent a huge collective shiver around the room! Again, all of the snippets we heard were very enticing. When not ‘on duty’, I attended quite a few talks and workshops, all of which I enjoyed and learned from, but I don’t have room to go into detail and in any case, the responses of the unpublished writers reporting on them would be more interesting to hear. The message which resonated most with me as an author (apart from the importance of perseverance, which I was saying myself but also heard repeatedly) was ‘Tell the Truth’, in Shelley Harris’s Taking Risks workshop, in the sense of writing ‘how it feels to be human’. I think that, and ‘write what you want to write’, is some of the best advice I was given on the long and bumpy road to publication; I took it, and despite all the obstacles, it was worth it when I got there. THANK YOU to Writers’ Workshop for their impeccable organisation and for the opportunity; to my friend and colleague Voula for making our new project so enjoyable; to our workshop writers for being a fantastic audience; to the writers who shared their scripts with me and to everyone who made it such a fun, sociable, inspiring and exhausting weekend. Time to get back to writing my new book! Next week my Sofa guest will be Festival of Writing star Tor Udall, author of A Thousand Paper Birds, on writing about grief. If you’re new to the Literary Sofa and would like to be notified of my weekly posts, enter your email in the box at top right. Hope to see you again soon! What a brilliant idea for a workshop. Sounds very useful.